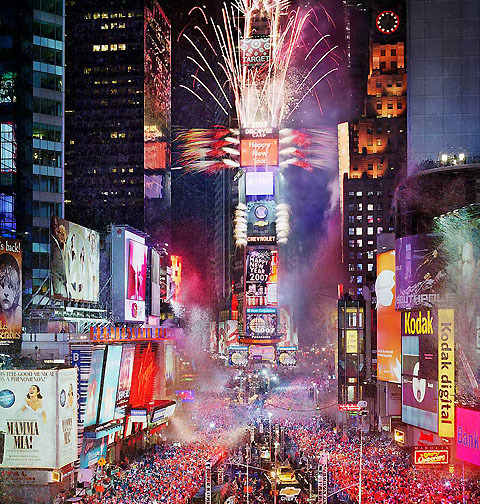 Island Breath: TGI Column - New Year's Eve is Here! Happy New Year! or Hau'oli Makahiki Hou! A little over a year ago I wrote a "future history" of Kauai that covered the years 2007 to 2050. This was in response to the Hawaii Legislature's 2050 Sustainability effort. In August of 2006 I attended the kickoff conference at the Dole Center in Honolulu and was very impressed. An excellent presentation was made at the conference that portrayed four distinct possible realities for our future determined by the influence of different groups: the military, the corporations, the technocrats, or the environmentalists. Each future scenario, although addressing some problems, failed in other areas. As you might guess, the future reality I preferred to live in was the one dominated by the environmentalists. It presented a state managed at the bio-regional scale (ahupuaa) focussed on traditional Hawaiian agriculture. Unfortunately, the 2050 effort that started off so well stalled and degenerated to a series of blathering platitudes, concluding with a badly constructed popularity poll. How did I do on the predictions made in 2006? Here's a section covering 2007 and 2008 (previously published on www.islandbreath.org under "Kauai 2007-2050"). There will be a consolidation of air carriers flying to Hawaii. The major mainland carriers to Hawaii are American, United, Continental, Delta, and Northwest. At least two are likely to be taken over or allowed to fail, with the first major tick upwards in jet fuel costs. Consolidation and bankruptcy means layoffs, reduced service and higher prices. Flight frequency will further diminish. Already increased security and regimentation have made it more difficult to fly anywhere. When petroleum climbs over and stays above a hundred dollars a barrel, it will be more expensive and not much fun to fly, even to Hawaii. Middle income people will not fly to Hawaii as a casual vacation destination. They will be too worried about making the next mortgage payment. Those that can take a vacation will drive to Orlando. Those who can't will take a bus to Vegas for one chance in a million to break even on their credit card debt. The Hawaiian airline tourist industry will begin a continued decline from which it will never recover. All the businesses that are attached to this industry will falter as a result. This domino effect will begin at the rental car counter and go on to effect everything else. There are several locations on Kauai with concentrations of small businesses fully dependent on middle-class tourist dollars. These include Koloa Town's main street; Hanapepe's historic district; Kapaa, Waimea and Spouting Horn's craft fairs, as well as the Port Allen boat tour industry. The bottom will begin to fall out of the tourism based Kauai economy by 2008. Soon this will be unavoidably apparent. The disappearance of the middle class tourist on Kauai will be the beginning of the reduction in the number of middle class residents on Kauai. Only the very rich will be left as "visitors" to Kauai. They won't be interested in the trinkets offered to tourists. In fact many of the mainland rich don't want to visit so much as reside. They already perceive Kauai as a retreat from the places where they made their fortunes. They suspect that their mainland homes will be unlivable in the near future. Population growth, overdevelopment and environmental degradation have made where they are unpalatable. As this group retires or cashes in, they will be looking for a place to bunker down for the hard times ahead. That is what is driving the conversion of thousands of acres of agriculture land on Kauai into five-acre MacMansion's today. This process will accelerate as the economy flattens and the rich seek cover. Real estate prices for "right location" on Kauai will stay in the stratosphere long after the real estate markets the rich left behind, on the mainland, are in shambles. The self interest of the very rich will help finance some alternative energy development on Kauai. The rich will continue to want to power the telecommunication and entertainment technology they have become used to, even if other tasks have to be performed with manual labor. They will encourage efforts like Apollo Kauai to achieve some level of energy independence for generating electricity using solar and wind sources. Those that can afford to so will continue to live much as we do today--only off the grid, generating their own power. My scorecard for 2007 should read "Close - but no cigar". Although Hawaii tourism was down in 2007, it did not falter as predicted and the businesses that rely on tourists' dollars have not been driven out of existence. Many of my predictions about the US economy and timing of a Hawaiian tourism slump were based on the expectation of sky-high crude oil prices. A year ago I was betting that crude oil would hit $100 a barrel during the year, and keep going up. My forecast on stratospheric oil prices was too early. I believe the "Tourism Falters" predictions will come to pass, but later than I expected. I still believe the 2008 events of "The Wealthy Bunker Down" are on track. There will be consequences for the rest of us. A recent article in this paper titled "Hawaii Residents Flee Expensive Isles" reveals that over ten thousand residents, facing steep housing prices and a high cost living, have been driven from the islands to the Mainland in the last year. Here are a few specific predictions about the events of 2008, a very political year. Don't take them too seriously... I didn't. On January 3rd, Barak Obama will win the Iowa Caucus, but Edwards, not Clinton, will come in second. The real surprise will come if Edwards can win in Nevada on January 19th. He could then easily carry South Carolina's January 26th primary. This will set up a three way race for Super Tuesday, on February 5th, when 24 states will have primaries. Bottom Line: I predict that Edwards is the most likely 44th President of the United States and he will be a populist president facing an economy as damaged as that faced by FDR. The Superferry will continue an underutilized service to Maui until the Hawaii Supreme Court overturns the Special Session legislation that allowed service to resume to Kahului Harbor. The John F Lehman Company will eventually make a long term lease of the Superferry Alakai to Blackwater Corporation for use by mercenaries. Linda Lingle's chief of staff Barry Fukunaga (and former Director of Transportation) will be charged with criminal conspiracy over his scheme to avoid Environmental Assessments for the Superferry Corporation. There will be more calls for a Lingle impeachment. Her political career will end with her current term. The Superferry will never resume service to Kauai. Moku District (ahupuaa) organization and management will gain more favor across many disciplines from food production to land use planning. Awareness of bioregional districts will play a significant role in the political outcome of our County Council election. Mayor Brian Baptiste will try to save his tarnished political legacy with a populist stand on overdevelopment. He will call for a broad moratorium on the kind of development Koloa/Poipu are experiencing now. But it'll be too little, too late. A year ago only a few people envisioned the blackhole that would open up under the feet of the investment houses and lenders over the sub-prime mortgage meltdown. Even months into the crisis, the full depth of its repercussions are still unknown. Reasonable estimates of loss are now trending from 500 billion to 750 billion dollars, with more loss to come. With credit lines freezing up and huge debts, this crisis, combined with the home building slump, could be enough to unravel the US economy. In 2008 the the US consumer economy could go down and stay there. Some economists have predicted that if the Federal Reserve Bank cannot quickly get a better handle on keeping credit liquid, there could be a major economic crackup just months from now, leading to an economic downturn of unknown scale and duration. The unpredictable is just that. But one can still envision a positive side to even this calamitous possibility. The collapse of economic growth could create a new culture in America. A culture based less on greed and more self sufficiency. The only way to solve the biggest problems we face (including our own extinction) is for all of us to live with far less than we do now. For us on the Garden Island it will mean more "Ho'okahi Kauai" or "Kauai alone, separate, in solitude, together as a unit, and at the same time, made one". 1) Grow some food in your yard and share it with neighbors. 2) Cut your shopping way down - Repair rather than replace. 3) Cut your gas bill in half - Drive half as much as you do now. 4) Accept less money in order to work closer to home, or better yet, at home. 5) Learn to make practical things you can use from local materials. 6) Acquire an artistic skill, like drawing or playing music, to entertain yourself. 7) Do things with others that are fun and do not require electricity. 8) Get involved with local issues where your efforts can make a difference. 9) Enjoy where you live and the places nearby that you can walk or bike to. 10) Don't worry... Be happy.